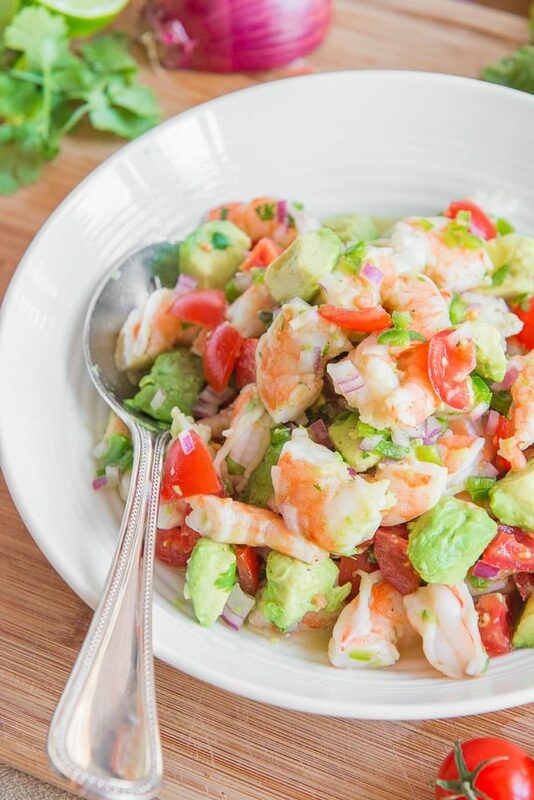 This fresh and light Shrimp Avocado Salad takes 10 minutes to put together and is reminiscent of a citrusy ceviche, but without any raw fish! 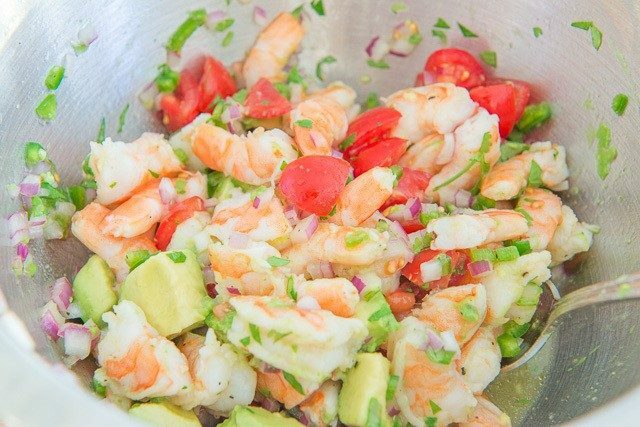 This dish reminds me so much of a fresh ceviche, except without all the anxiety about food poisoning. 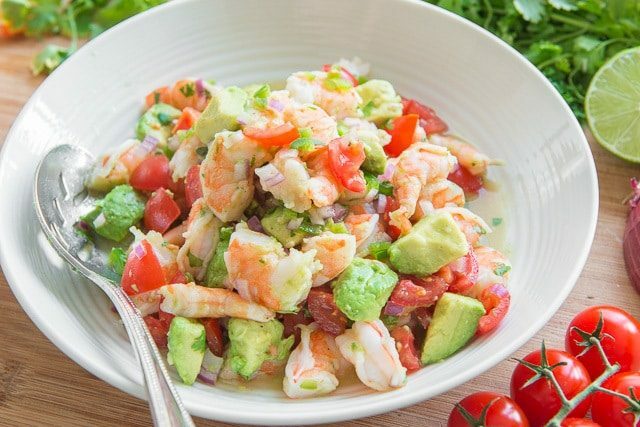 I know, it’s not glamorous to talk about that, but the first time I ever tried ceviche I got sick, so whenever I can have a substitute that’s cooked but similar in flavor, I’m a fan. 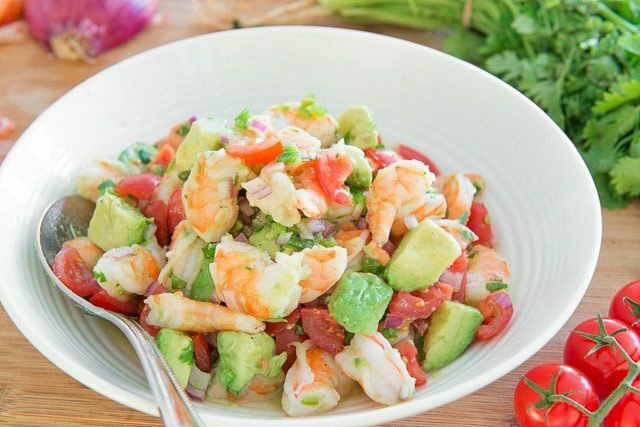 This Shrimp and Avocado Salad is from my friend Gina’s new cookbook, Skinnytaste Fast and Slow. This is her second cookbook following up her New York Times Best Seller from two years ago (you may remember the Buttermilk Oven Fried Chicken I posted from her last book), and this one is all about super fast recipes and slow cooker recipes. Isn’t that brilliant?I have tried a handful of recipes from her book so far (the stuffed cabbage rolls and slow cooker chicken and dumpling soup are favorites too) but this salad was the first one I tried. I saw the photo and had an instant craving. Oh, and did I mention that this took me 10 minutes to make? It’s so fast! I bought a bag of pre-cooked shrimp from the grocery store and did a quick thaw by running it under cold water for about five minutes. Let that sit for 5 minutes. Then the salad is ready to serve! This dish feels very summery to me, but truth be told, I’m eating it in October. I love the flavors and see this as a regular lunch for me. If you’re a fan of lighter dishes and need more quick and slow cooker recipes, I can’t recommend it enough. For a similar flavor profile that’s also healthy and light, this Avocado Tuna Salad from A Mindfull Mom looks SO good. Happy cooking! 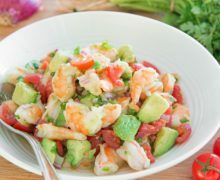 This fresh and light Shrimp and Avocado salad takes 10 minutes to put together and is reminiscent of a citrusy ceviche. A perfect appetizer from the Skinnytaste Fast and Slow Cookbook! 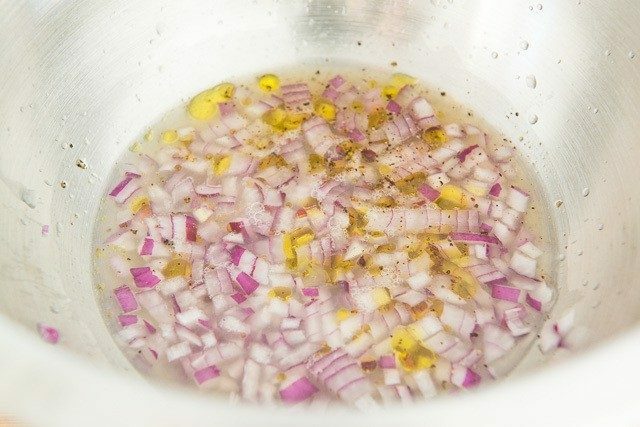 In a small bowl, combine the onion, lime juice, olive oil, salt, and pepper to taste. Let sit for at least 5 minutes. 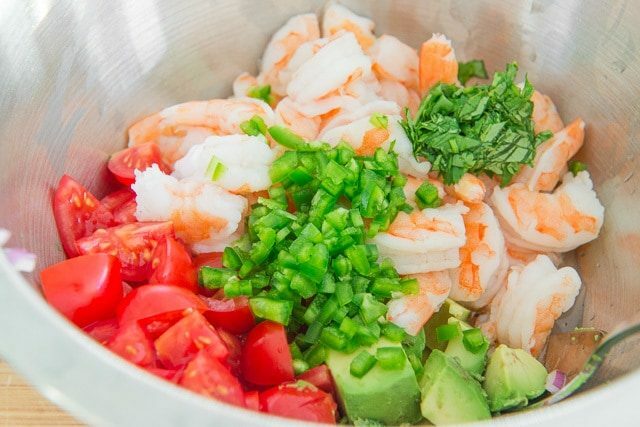 In a large bowl, combine the shrimp, avocado, tomato, and jalapeno. Add the onion mixture and the cilantro, and toss gently. Season with pepper, if desired. Hi how long can this last in fridge? This recipe doesn’t keep well, especially the avocado, which browns quickly. I’ve kept leftovers for this dish before, and the acid in the dressing shrinks the shrimp and makes it tougher. So honestly I wouldn’t keep this longer than an hour or two. I loved this recipe! Tastes so refreshing. Will be making again. 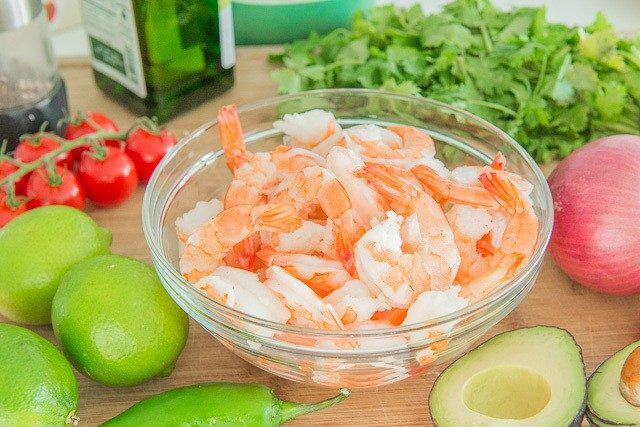 I would suggest making only the amount you’re going to use because it really doesn’t keep well as the avocados start to turn brown and the shrimp seems to get tougher. Hi Mari, so glad to hear this! Yeah, it’s a bummer it doesn’t keep better. It’s most suited to a one-batch meal. Happy cooking!